I love to explore, to travel, to meet new people and see the amazing diversity of this world. Originally from the UK, I have travelled around the world and worked in the UK, US, China and most recently have spent the last 8 years living in Jordan. I love Jordan, the hospitality of the people and the amazing diversity of the landscapes, the mountains, the deserts and dramatic canyons. 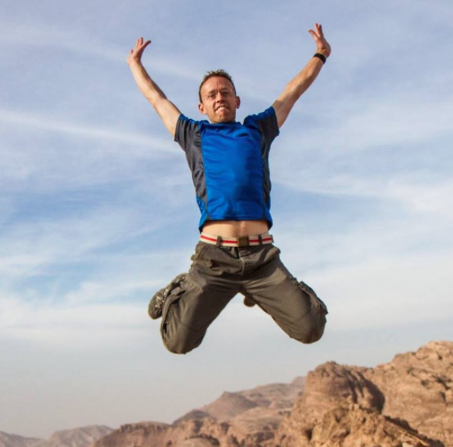 I started Experience Jordan with a friend in 2012, as we wanted people to see the places and people we love, to meet the authentic and hidden treasures and truly experience Jordan. For me travelling is about creating memories, new experiences, broadening your horizons and perspectives. Travelling allows you to step away from the norm and can be life-changing. It’s the time when we dream about life, what we want, where we are going. Many of us have made life-altering decisions whilst travelling, as we seek to get perspective on everything we’re doing and make choices about the future. We want our tours to be life changing for you. We try to provide opportunities to truly experience and engage with a different culture and some of the world’s most amazing natural wonders. Our trips allow you to really see Jordan, meet the people, hear their stories and experience the culture. As part of our commitment to the people of Jordan, we continue to pioneer new tours and experiences to create jobs and generate income for our local partners throughout the country, both in Amman, but also in the rural communities and Bedouin families across Jordan." "In 2004 whilst at university I wrote a business plan for a “life changing” tour company, life changing for both the travellers and the local people. The vision was for tours where the travellers see and experience the real destination, off the beaten path, engage with the people and culture and where the locals truly benefit through ethical and responsible tourism. I wanted to create a business that I believed in, one that both I and others would enjoy working for. A few years later, after careers in Engineering, Project Management and managing a climbing centre, I started Experience Jordan. My own life has been changed and shaped by my travels and encounters with so many people around the world, and I wanted to create experiences that were equally life changing both for travellers and the locals. In 2008, after time living in China, the US and back in my home England, I moved to Jordan and fell in love with this historic and beautiful country and its amazing people. Experience Jordan was born. 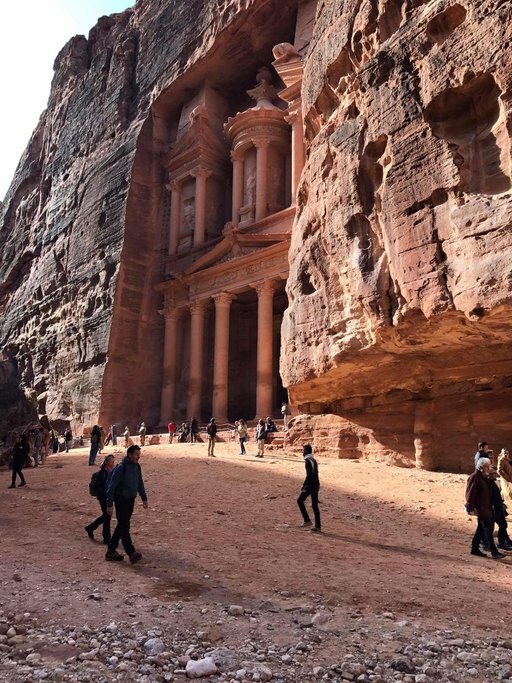 We aim to provide authentic adventures and the best tours of Jordan, where you truly experience this wonderful country, enjoy the hospitality of its generous and kind people, learn about the culture, history and even language and have lots of fun." "My first travelling adventures began in 1997 when I set off on a year of exploration and adventure, working and travelling around China. At the end of my time, I didn't want to leave suddenly, so I took the long way back overland by bus and train from Hong Kong, via Beijing, to Moscow and on through Europe back to London. On the train crossing Siberia, I used up my cash, with no ATMs until I would arrive in Moscow. I was living off the large bag of pot noodles I brought with me, yes noodles for breakfast, lunch and dinner. A lovely Russian family on the train took pity on me and shared their fish and more wholesome food with me. I spoke no Russian, and they spoke no English, but we connected, and I was touched by their kindness to a complete stranger. I love that travelling exposes our vulnerabilities, not speaking the language or knowing our way around, it forces us to rely on others and through that we grow and make lots of new friends." The country of Jordan awaits! This itinerary covers most of the major cities of Jordan along with the main experiences, and popular sites that one should see. You’ll experience Jordan’s great history and traditional culture, and enjoy the hospitality of its people. Planning a trip to Jordan? Here's a list of the top ten activities to help give you an idea of great things to do. We've focused on unique things to do in Jordan that provide you with a more authentic experience. The guide that showed up was not the guide we arranged for. Our visit to Jaresh was not in our original schedule and we didn't talk about it. All went well and as described. We had a great time and would recommend the Kempinski Hotel at the Dead Sea. The Movenpick at Petra was very well located and the service great in both. Our guide Mansour Mansour had our visa organised n collected us from the airport n took care of everything for our whole trip. Lovely and informative man. Our guide at Petra, Neal Hamadeen, was very knowledgeable and passionate about Petra. We decided to go to the Monastery so he charged us 50 JD extra. We were happy n he organised donkeys at 10 JD each. Worth it but not for the faint hearted as the donkeys navigate a series of old steps and rises. Petra incredible. Thank you Kimkim for organising a great trip. I'm pleased you enjoyed your trip, if only for a couple of days. I hope next time you can stay longer. Yes the hike or donkey ride up to the Monastery is a bit of an adventure, but worth the trip, as the Monastery is fantastic. our guide Ali was excellent. He was very knowledgeable in all topics. We enjoyed his company immensely. Always helpful and accommodating. I'm glad you had a good trip guys, and please that Jenny was able to experience of much of Jordan as possible. Both our guide and driver were excellent. The major disappointment was the Al Capitan camp. The room lacked heating and the hot water was luke warm. We did not feel it was up to the standard we were expecting. I got a cold due to the coldness. Thanks Rob for the feedback. We're pleased you had a good trip. Due to it being peak season the regular camps we work with in Wadi Rum were fully booked, but normally captains camp is fine. None of the tents have heating, but normally there are extra blankets available, and guests generally sit by the fire in the evening before sleeping. This doesn't help you, but the other camps we prefer to book with do have electric blankets on the beds, which do help. I'm sorry you got a cold, I hope you feel better shortly. I really appreciate this service and the help Matt Loveland provided. A couple things could help improve the process. 1) This is the first time I tried kimkim, I really like the idea and hope to see it grow. It really lends it self to setting up last minute plans. So with that in mind, it did take a while (2 days) to get an initial response. We were just about to make other plans when we finally heard back. 2) Some kind of printable confirmation to show to people when we arrive at facilities/tours/etc. There were times when people had no idea who we were or how we booked, it was difficult to explain to them. In the end it worked out though. Thanks for the comments. You were our first customer booked through KimKim, so we were still refining the communication process, so I apologise for the initial delay in responding. We have a printable handout you can use, and we will make it clearer to the suppliers about the booking process.